For a while I've been trying to put things together so that I can have a fairly accurate armour harness made based on Italian armour from around the 1430s, the only thing I haven't been able to find actual artifacts for is shoulder armour. Artwork I've found from the time (as seen in the link I included) doesn't depict it too well (I usually can't even tell if it's supposed to be spaulders or pauldrons). Anyone know what that drawing might be representing in terms of shoulder armour? At the moment I am m getting armour more for costume purposes, but I may eventually get into reenactment or living history, so I'm trying to get the armour as historically accurate as possible. So I'm not really interested in Epic Armoury armour, thanks for the suggestion though. 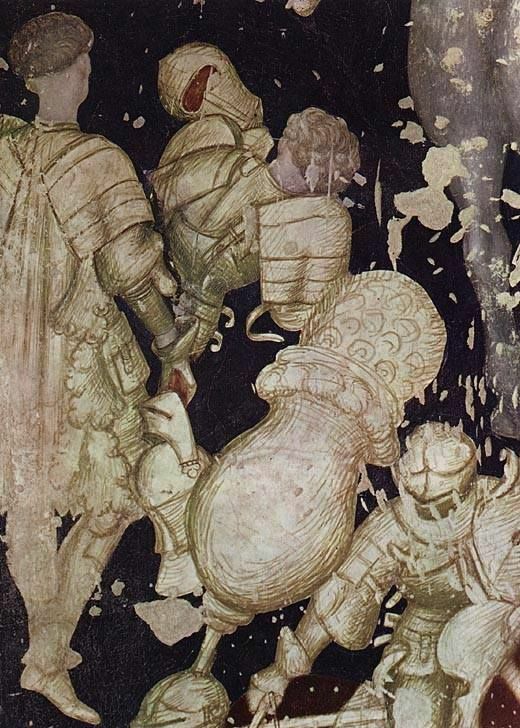 Google 'Mantova ducal palace Pisanello' and you will see frescos from the mid 1430's showing very large pauldrons They go back further than that. Thank-you for this, I've been searching for a good source on shoulder armour for several months, this helps me tremendously. Here's another painted by Fabriano c. 1425.